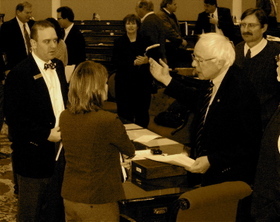 Seven Days Blogs: Freyne Land: Bernie in the House? Spoke to the enviro committees at 11 AM. Upbeat was he. Incredibly upbeat! Vermont's Independent US Sen. Bernie Sanders told lawmakers gathered in the Vermont House chamber, that global warming is "a very, very serious problem," one that scientists have underestimated and, he added, it is “absolutely beyond comprehension” that the Bush administration has refused to address it. However, Ol' Bernardo was upbeat with good news about global warming. I'm not making this up. And the good news - said Sanders - is that we actually do know how to reverse global warming by moving boldly on energy efficiency and promoting sustainable energy sources such as wind, solar, geothermal and biomass. We can reverse global warming and in the process, he said, create millions of new jobs! "On this issue I’m upbeat because we know the answers. We have seen it. We know what energy efficiency can do. We know the potential of solar, the potential of wind and geothermal. The question is to put into action - make real what already exists. "We don't have to think of what to do, we know what to do. It's a question of implementing what we know." Sanders said we have the potential right now to create dozens of solar/thermal power facilities in the nation’s Southwest that could meet one-third of America’s energy demand - without producing greenhouse gases. All that’s required, said Sanders, is a change in priorities in Washington, so such projects get funding, rather than having tax breaks lavished on Exxon-Mobil, a corporation that reported a $40 billion profit last year. The debate on global warming fights on. What we should all agree on, whatever side of the issue we favor, is that it makes sense to do all cost-effective energy saving measures now. You don't have to believe in global warming in order to be in favor of these measures. They save money, they reduce greenhouse gasses and other pollutants, they reduce reliance on foreign sources of energy, they help preserve our resources for future generations, they stimulate our local economy etc. etc. So far this isn't happening. Many efficiency or renewable options that are cost effective today are not being pursued. Let's hope that we have the smart people in our legislature that, with our help, will realize they need to use their tools to ensure that cost effective energy saving measures will be carried out to the benefit of us all. Speaking of energy use....the article in the Free Press on the award to the Davis center at UVM....did I read that wrong or was it a misprint? I thought they said that the Davis used $1,000 per day of electricity. Isn't that what it said? $1,000 x 30 days = $30,000 per month! That can't be. 250 households at $80 per month only use $20,000 worth. Tell me this is a mistake. UVM can't be receiving a reward and using that much power in the building.